Students listen attentively to the CFCA scholars during a tutoring session. 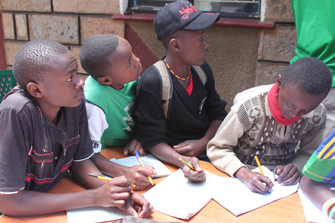 It is a hot Tuesday afternoon and sponsored children are gathered at a local CFCA office in Kenya, with their books and pens, keenly following what they are being taught. The teachers of the day are Vincent, who is pursuing a degree in business administration and accounting, and his colleague, Kevin, who is enrolled at a local university studying for a bachelor of commerce degree. The two students are both 23 years old and part of the CFCA Scholarship Program. The two scholars decided to create an academic club for sponsored children who needed extra help with their studies. 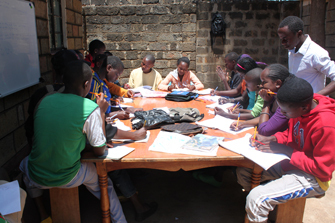 The club is facilitated by 17 scholars who choose different subjects, in which they excel, to tutor the sponsored children. These subjects include mathematics, business education, science and geography. CFCA scholars tutor sponsored children in different subjects. CFCA staffers shared the idea for the academic club with parents of the sponsored children and it was well received. 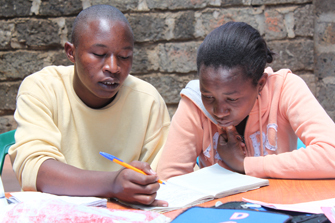 Each time the schools close for the holidays, the children can now come for tutoring classes that are free of charge. “We had to find out from each child what his or her weak subject is and took it upon ourselves to help them improve on it,” Kelvin said. The academic club is also like a mentorship club. In addition to tutoring students, the scholars hold counseling sessions where they discuss various issues affecting the children. Scholars will also hold career talks and select topics to debate. “It is easier for the children to open up to the scholar students because they feel free to talk to them on various issues they may be facing academically and socially,” Natala said. Though the sun is scorching hot, the children are participating actively in each lesson. “It is encouraging to see the childrenís grades improve,” Vincent said. A meeting of the minds: CFCA scholars tutor students during an academic club meeting.